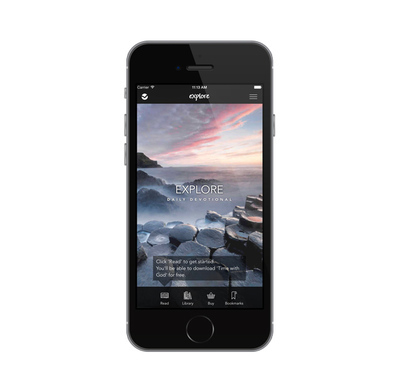 The Explore App contains daily Bible readings with questions to help you engage with the Bible. The Explore app contains daily Bible readings with questions to help you engage with the Bible text, comment to get you thinking, and ideas for further reading, prayer and application. It includes the Bible text so that you can open up the Bible wherever you are, whenever you can. Contains a free 28-day introduction, Time With God, to help get you started as well as a free set of notes on the book of Titus. Then choose from monthly notes taking you through the whole Bible, or pick from over 50 packages on individual books of the Bible. Also includes topical note packages, on Easter, Christmas and plenty of other topics! New notes added regularly. Explore is written by trusted Bible teachers with a passion for getting God's word to work in peopleís lives. Contributors include Timothy Keller, Mark Dever, Mike McKinley, Christopher Ash, Graham Beynon, Tim Chester and Stephen Witmer. A resource like Explore needs to be highly disseminated. Sundays are not enough, we need God's Word everyday. Explore satisfies that need. Reading the Bible daily is an integral part of growing as Christians, and these notes are practical and insightful. Many in our congregation have been greatly blessed through their daily use. Really good on android and very useful. Would be great to have a windows 10 version for using on computers and tablets though. I'm really enjoying using the Explore notes on my Android device, having used the printed version for several years. I've just purchased the app version in addition to my printed subscription because these are so easy to use and to bring up the cross references with just a tap of the screen. An excellent tool for daily bible study. Doesn't always open to correct date, but it's no trouble to use next button to get to the date you want. When it works, it works great. But so many times I've been left frustrated because it just won't load the list for me to download the next issue! Thanks for the feedback. Glad you enjoy the App but am sorry you find it frustrating. The App has expanded beyond its original plan and so the load times can be a little tedious. We're working on a complete redesign which should help fix this. Watch this space! Brilliant resource that is faithful to the Word and has been going for years. And now in app and kindle form it makes looking up those cross-referenced passages easy, especially on the move. Bible as well as the usual monthly notes. I've been loving this app on an Apple device for almost a year now. I just purchased an android device and was wondering if there is a way to download previous purchases to my new device or if I have to buy them again. Thanks for the great bible studies! Sadly there's no way to sync between Apple and Android devices at the moment. It's something we're working on but I'll contact you direct and get your previous purchases installed on your Android. Thanks. I cannot recommend Explore notes highly enough!! Thank you!! Thanks for the review. We've fixed the little issue - normal service resumed! This is such a fantastic app! For those of us abroad with no access to English language notes or Christian books this has been such a great help!! In fact it was one of the main reasons I bought an ipad and I haven't been disappointed! I also recommend getting the app prayermate to organise your prayer lists and then everything is there! Thank you so much! !